This really should be called Refrigerator Salad, since that’s what it is – a mix of miscellaneous ingredients that were just hanging out in the fridge. So feel free to add, change, or exclude any ingredients as you see fit (or as the contents of your fridge dictate)! A simple, yet delicious and healthful chicken, avocado, and spinach salad that's great for a light dinner or a tasty lunch (or exclude the protein and serve it alongside your favorite main dish)! Did I mention it's only about 300 calories? 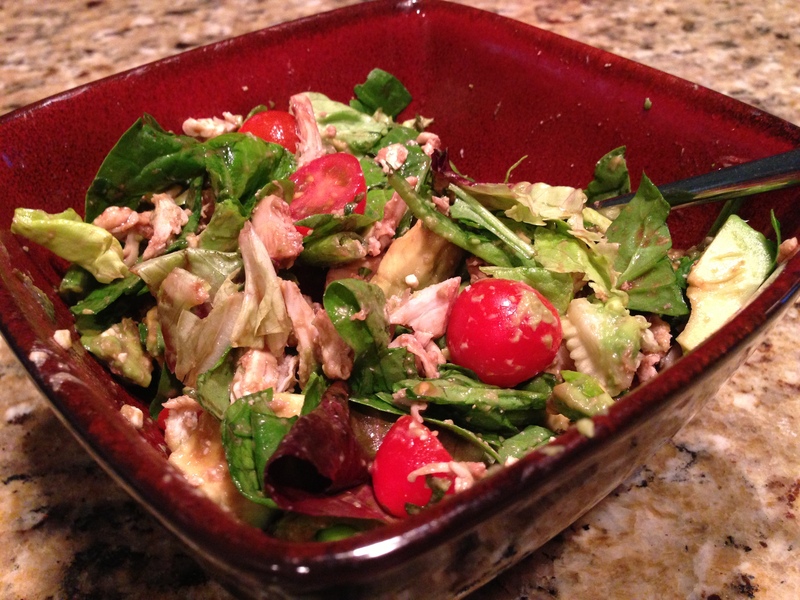 Drop the lettuce and veggies in your favorite salad bowl. Whisk or shake the dressing ingredients until well mixed. Give your lime a firm roll on the counter with the heel of your hand or zap it in the microwave for about 10 seconds. This will help get the juices flowing!